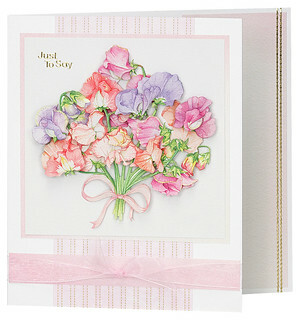 DCD666 Sweet Peas Die-Cut Découpage. CP311G Pink Mottled Stripes With Gold Foil Creative Paper. SR043P Ruth Watkins Background 03 Creative Paper. XL642U-01 Tiny Birthday Mix Peel-Off Stickers. MTR06-117 Pale Pink 15mm Organza Ribbon.